Jumbo Joe Thornton is a hockey icon. There’s no two ways about it. His fantastic and quirky outfits and many pets, coupled with his trademark beard and funny personality, have made him one of hockey’s most intriguing characters. Oh, and he’s pretty good at hockey, too. The 39-year-old star for the San Jose Sharks is known best for his abilities as a playmaker, and tonight, accomplished a very impressive feat in the stats department. The St Thomas, ON native registered his 1049th assist tonight, and with the tally, tied Mr. Hockey for the 9th most in NHL history. Like we said, he’s quite the playmaker. The assist came in a game where the Sharks downed the Oilers 5-2 in Edmonton, and Kevin Labanc recorded his first ever NHL hat trick. We’re not superstitious, but we do believe in good pizza, and ahead of this game, a local pizza parlour dubbed the Sharks the Stanley Cup Champions this year, on National Pizza day, nonetheless. Kane scored too, just for the record. 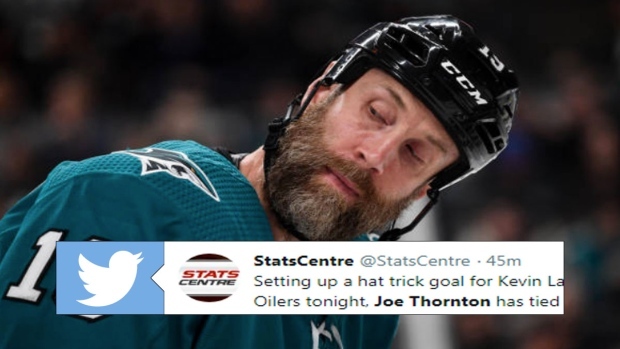 This is a fantastic feat for Thornton, and the only question is, does Labanc keep the puck for his first hat trick, or does Jumbo Joe keep it for his record-breaking helper?